There are over 100 anti snoring devices on the market today. Each one of them claims to offer you a natural way to stop snoring. However, before you waste your time researching them or money to buy them you needs to know that they really work. The problem is that they don\’t ever address the real underlying issues of why you snore in the first place. There are also so natural ways promoted including homeopathy, aromatherapy, and magnetic therapy. However, there is no evidence to suggest any of them will work for you either when it comes to your desire to stop snoring. Among the treatments recommended to prevent or stop snoring are some useful and interesting devices. Learn about the top selling devices that have proved to work against snoring, may be to some extent. One of the common reasons for snoring is narrowing of nasal passage. Nasal strips are designed to deal with the situation. These strips contain adhesive and are applied across the nose. The idea is to pull out the sides of the nose so that the nasal passage widens to breath conveniently while sleeping. An interesting device used as solution against snoring is the anti-snoring ring. The ring is worn in the little finger of the left hand where acupressure points are located. Based on the traditional acupressure technique from China, the ring produces a calming effect by targeting the points connecting to nose and ears. Moreover, these rings are stylish enough to adorn your finger. It enables the patient to sleep comfortably on his/her side. Sleeping in an incorrect position or posture is another common reason for snoring. Snoring pillows are among the top anti-snoring devices as they help in aligning different parts of the body. Head is aligned with the spinal cord in order to achieve a clear air path. These pillows work the best for people who usually sleep on their backs. Anti-snoring mouth gaurds address another common cause of snoring. Soft palette vibrations are what these devices target at. The mouthpiece is placed over the teeth in order to hold the jaw in forward direction. The idea is to widen the throat air path so that air circulation improves. These devices are designed to adjust to the natural shape of jaws. People who sleep on their back are more likely to produce huge snoring sounds. Snoring balls are among the interesting solutions that enforce such people to sleep on their sides. These balls are placed at back inside the clothing of the person suffering from snoring, making it difficult for him or her to sleep on back. Sideways sleeping prevents the person from producing high snoring sounds. A very popular gadget, sold like hot cakes across the world. 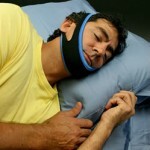 Chin straps are the popular anti-snoring devices that work by preventing mouth from opening while sleeping. The ultimate idea is to encourage breathing through nose as it eliminates the possibility of soft tissue vibrations to be produced. These devices are designed to be adjustable and comfortable for the people to wear while sleeping. Nasal congestion being another root cause of snoring should be treated to keep the nasal passage clear. This can be achieved by cleaning the nose with saline solution. Throat and nasal sprays are used as anti-snoring solutions to provide natural lubrication. The idea is to ensure that the soft tissues don\’t stick to one another. This will lower down the number of vibrations produced. If you wish to go to that extent, permanent implants can be placed in the soft palate through surgery. These devices help in stiffening the palates so that vibrations are not produced in excess. A last resort in desperado, a final solution for some. Specialist ear plugs to combat the low frequency snoring sounds. *Comment: Please do some research before spending your money on these gadgets.